Sturdi Products :: Parts :: Zipper Security Clip :: Sturdi - Zipper Security Clip , 1 Pcs. Home/Sturdi Products/Parts/Zipper Security Clip/Sturdi - Zipper Security Clip , 1 Pcs. Deter tricky cats and dogs from opening zippers with these handy clips. 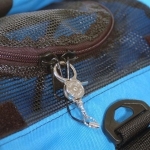 Bring double zipper heads together, open claw like clip and place in zipper pull holes closest to the chain (see product picture). Works well on all pet carriers and pop-up shelters. Caution: The Zipper Safety Clip is not a locking device.